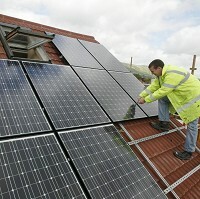 FOE energy campaigners have criticised the government’s decision to cut back subsidies for large scale solar installations. The decision means that projects up to 50kw remain unaffected but subsidies for larger schemes will be slashed from 32.9 per kilowatt-hour to 19p and even more for the largest ones. The move is likely to discourage major investment in solar energy at a time when the cost of carbon-based fuels is rocketing leaving many this winter having to a choose between fuel or food.